Our consciousness requires daily awareness and upkeep. Lynn Barrette, MSW, LUT, shares with us a few spiritual 'ablutions' to keep in mind on a regular basis. Life is a spiritual journey with the purpose of understanding ourselves and becoming conscious of all that we are, have been, and can be. Charles Fillmore, co-founder of the Unity movement, taught reincarnation as early as 1900, and believed it to be a merciful, practical law for evolution into higher states of universal awareness. 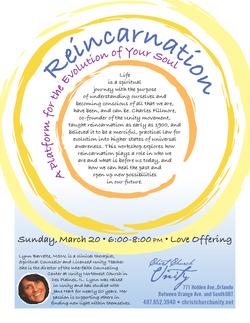 This workshop explores how reincarnation plays a role in who we are today, and how we can heal the past and open up new possibilities for our future.